So happy that this is finally back! Good episode. PB finally got an origin story, sort of, and her farmer's outfit was cool. Neddy was kind of annoying though. For some reason, I thought the new season wouldn't start until the new Marceline story airs. A good fable about how having the right good early experiences to set you up is really just a matter of luck and sometimes means everything. But still everyone has a purpose. We can't stop saying "spawned from the Mother Gum" to each other. While I still really dig these new episodes, almost all of the main Adventure Time characters seem to be dealing with some serious ennui or melancholy this season. 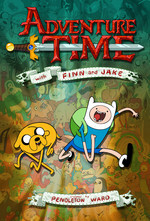 In this episode, Finn seems actively depressed as he goes about the quest. drezdn, the overarching theme this season appears to be passage from adolescence to adulthood, for Finn, PB, and Marceline. I highly recommend The Annotated Adventure Time , with a lot of very inciteful commentary. Thanks for the link. For some reason, I'd never heard of it.